Action A1 aims to observe and validate future climate simulations at the vineyard scale. The objectives are to deploy the already-existing measuring network (development of a system that directly transmits data and provides data on a web platform) and to integrate climate change scenarios in high-resolution climate models. The first step is to assess, through the high-resolution network, the spatial variability in each site and perform multicriteria spatial modelling. A connection between each sensor (per site) has been created in order to download real time data continuously via a Global System for Mobile Communications (GSM) and thus examine them via Internet. Each partner is able to take measurements of vine growth and development, to spatialise the resulting data, and correlate it with high-resolution climatic variables and indices. High-resolution climatic modelling will be performed using the EUROCORDEX models, in order to provide extreme event evolution scenarios in the context of climate change. Agronomic modelling is developed by testing at a very refined scale the GFV model in vinegrowing regions, with temperature data collected with Tinytalk sensors placed within the vineyards. At vineyard scale, climate variability can be significant in magnitude and play a key role in vine and wine characteristics. 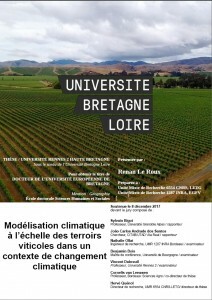 Adaptation of viticulture to climate change requires knowledge about future fine-scale climate evolution. This study aims to integrate local scale in future climate projections, coupling dynamic and statistical modelling. A first step consisted in producing temperature maps at 1 km resolution using WRF in a vineyard area and evaluating model uncertainties. It revealed that dynamical models do not represent well local climate variations. 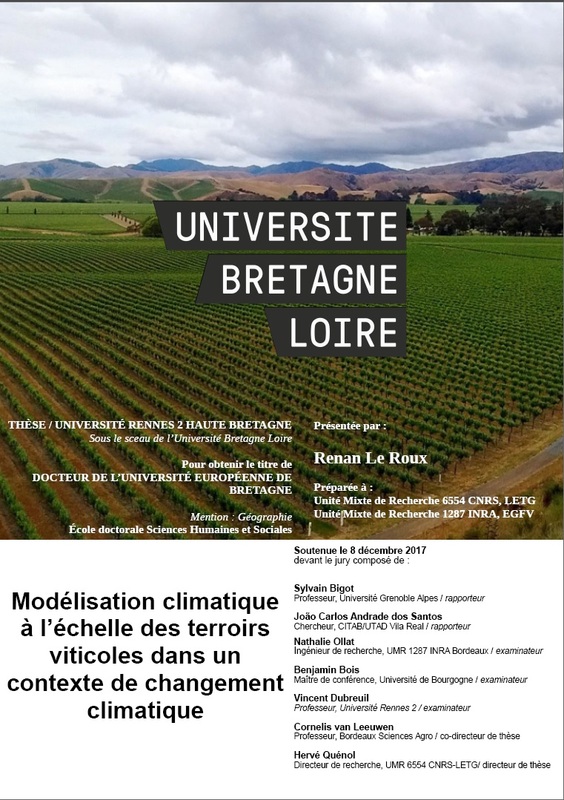 Using a high density temperature data logger network, the second part is dedicated to developing a non-linear statistical model to map temperature at very fine scale in famous sub-appellations of the Bordeaux vineyard area. Following, a method, coupling dynamical and statistical modelling, is proposed to integrate local scale in climate change projections. This thesis highlights that using simultaneously statistical and dynamical models can be an approach to reduce model uncertainties.